DVD: Angels! Demons! The Brother’s Winchester! It Has to be The Complete 4th Season of Supernatural! 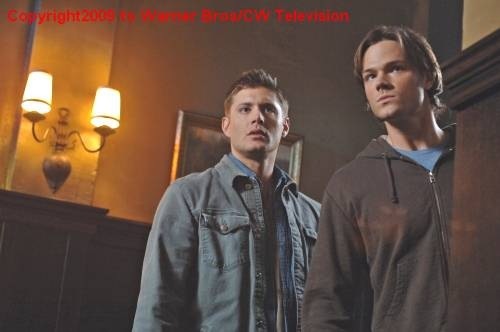 At the end of Supernatural season 2 and all of season 3, the gates of hell had been opened and Dean Winchester (Jensen Ackles) had a deal coming due for his soul: the soul he had traded into hell in one year’s time for the return to life of his younger brother, Sam Winchester (Jared Padalecki). In the exciting season 4 of the hit CW/Warner Brother’s series, the gates of heaven have been opened as well and the Angel Castiel (Misha Collins) lifted Dean out of hell after he had suffered 4 long months of torture at the hands of the demons. But was it too late to keep Sam from going down a dark path with his guide, the demon Ruby (now played by Genevieve Cortese) who seemed like a friend but could easily be a foe. And did hell change Dean Winchester more than Sam wants to admit? All this amid a desperate race to stop the demons from breaking 66 of the seals needed to hold Lucifer imprisoned. Can Sam and Dean Winchester pull back together as a team in time to do this? The answer to this question and many more lies in the 22 episode, six disc collection of Supernatural season 4. From the dramatic moment in which we see Dean Winchester’s hand breaking free of the grave and of him dragging his fully restored body out of that grave, to the reunion with his brother Sam: a reunion at turns filled with powerful hugs and dark recriminations, Season 4 of Supernatural sets the pace for one of it’s most exciting and daring seasons to date. Supernatural season 4 takes the Winchester brothers and the viewers on a wild ride! Series creator Eric Kripe and his team of writers that includes Sera Gamble and Ben Edlund throw curve balls that include the introduction of the angels and more of the demons from hell such as the sinister Alistair with whom Dean has a dark and terribly history and Lilith with whom Sam as a destiny to destroy..or does he? In season 4 the series takes on such topics as time travel, 6 foot live action teddybears and a run in with a shapeshifter with a penchant for impersonating classic horror monsters. This particular episode, Monster Movie was shot in HD black and white as homage to those very same classic horror movies of yesteryear. And just when Sam and Dean Winchester think it couldn’t get any worse, they find out their lives are an open book, literally! Season 4 has the return of stalwart ally, Bobby Singer (Jim Beaver) and new allies psychic Pamela Barnes (Traci Dinwiddie) and the once fallen angel Anna (Julie McNiven). But in the end it comes down to the brothers and it’s not like the old days as Sam and Dean find themselves battling against both sides of heaven and hell and at odds with each other over how to deal with stopping the seals from being broken and Lucifer from being set free. 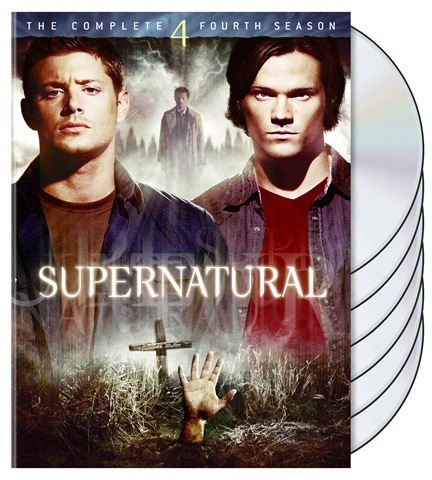 The Complete season 4 DVD set includes extended and deleted scenes, a gag reel and special feature titled: The Mythologies of Supernatural – From Heaven to Hell a 3 section featurette gallery bridging Heaven, purgatory and hell to examine key mythological precepts. All of this is handsomely..and I do mean handsomely as the stars of the series are featured very prominently..packaged in a sturdy plastic casing that holds the disc firmly in place and comes with a handy fold out booklet listing all the episodes with brief synopsis, photos and features. Check out The official Supernatural DVD site for more details on ordering the complete 4th season of Supernatural to complete your set of all 4 seasons. Then tune into the CW Network on Thursday, September 10th at 9PM EST to catch the premiere episode of Supernatural Season 5, Sympathy for the Devil. Supernatural stars Jared Padalecki, Jensen Ackles and new series regular Misha Collins.